Quality Feed & Garden Company > Poultry > How Much Room Do My Chickens Need? How Much Room Do My Chickens Need? Ask any chicken and she will tell you she needs space to stretch her wings, a place to forage, a nice dust bath, and some shade where she can spend the heat of the day. Adequate space will keep your hens happier and healthier. It will also make it easier to keep the chicken yard cleaner and free of odors that might bring neighbors knocking. The space a chicken needs varies during its lifetime. 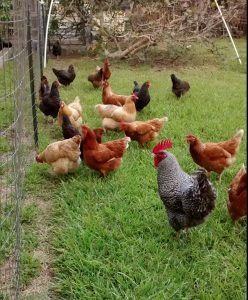 It also varies depending on whether your flock will be penned all of the time, or will have some free-range time each day. Over-crowded brooders can lead to disease and injury. Crowding causes stress, and stressed chicks may peck at each other, leaving open wounds. Open wounds lead to infection and to additional pecking by other chicks. Over-crowding can also lead to spilled water and soiled food. When water spills and soaks the bedding, the humidity in the brooder will rise. Humidity exceeding 30% combined with feces covered litter and the warmth of the brooder is a breeding ground for coccidiosis, the number one cause of death for chicks. Allowing sufficient space in the brooder, and keeping the brooder clean, will help keep your chicks healthy and happy. Happy chicks grow up to be happy (and productive) hens. Always provide the most space you can for your birds. Provide amenities in the run to prevent boredom. Dust baths, swings, and treat feeders all provide things for your girls to do during their day in the run. Larger flocks may actually use less space because they will huddle together when roosting. However, it is best to allow the maximum required space when planning since your flock size will likely change over time.